The Imrei Emes of Ger and the Chofetz Chaim were traveling on the same train. At one of the stops, a resourceful Gerrer chossid found his way on to the train and pushed his young son towards the rebbe, hoping he would give the child a brocha. The rebbe told the chossid that the Chofetz Chaim was on the same train and it would be advisable to seek his brocha. The chossid followed the advice of his rebbe and approached the Chofetz Chaim for a brocha. He, in turn, suggested that they try to get a brocha from the Gerrer Rebbe. “The rebbe told us to come here,” the chossid said, so the Choftez Chaim agreed. “Tell me yingele, what are you learning?” the Chofetz Chaim asked the child. “We are learning the Gemara in Bava Basra 31a, which discusses the topic of ‘zeh omer shel avoisai v’zeh omer shel avoisai,’” the boy replied. The Gemara discusses how to adjudicate a case where each litigant claims that he inherited a particular field from his father. In fact, that is the sugya of every Jew at all times. “Zeh omer shel avoisai.” We seek to follow the ways of our forefathers. Last week, we chanted the words found in Oz Yoshir, “We declare our loyalty to Hashem, the G-d of our fathers, Elokei ovi va’aromemenhu.” Rashi explains, “Lo ani techilas hakedusha – This belief didn’t begin with us.” We are links in a chain; holding on to what was transferred to us and endeavoring to transmit it to those who follow us. A person is blessed and fortunate when a father or grandfather shapes him and connects him to the golden chain that stretches back through the ages. Last Friday was the 25th yahrtzeit of my zaide, Rav Eliezer Levin. A quarter century has passed since I spoke with that great man. He was known as the beloved rov of Detroit, an elder statesman of the rabbinic world and a revered talmid chochom. He was appreciated for his dignity and perfect conduct, as a mechunach of the great Talmud Torah of Kelm and a ben bayis in the home of the Chofetz Chaim. But to me, he was zaidy. My warm, loving, gentle, wise grandfather. Our encounters, going back to when I was a small child, shaped me. All the moments and conversations throughout the many blessed years reverberate in my head and are on constant replay in my heart. By watching him, I could see the paragon of the many lessons we were taught, such as those concerning emunah, tefillah, simcha, dikduk b’halacha and princely middos. I had many great rabbeim over the years, and for me he seemed to be the role model for every message they preached. Twenty-five years later, the exactness and precision of his actions and words live on because they were perfect and true. Rav Elchonon Wasserman would leave his yeshiva and talmidim in Baranovitch each year for the duration of the month of Elul to spend that time with his own rebbi, the Chofetz Chaim, in Radin. After the Chofetz Chaim’s passing, Rav Elchonon began to travel to the yeshiva in Kelm for the Yomim Noraim. The Sefer Zikaron Bais Kelm recounts that when asked why he left the yeshiva and headed to Kelm, he would respond that he had a kabbolah from the Chofetz Chaim that the gates of tefillah were in Kelm. One year in Kelm on Rosh Hashanah, the baal tefilla was chanting the words of “Vetaheir libeinu l’ovdecha be’emes – Purify our hearts to serve you with truth.” The chazzan began to cry as he said “l’ovdecha be’emes,” unable to complete the word “l’ovdecha.” There was great emotion as the chazzan sobbed, hoping that the kehillah might merit serving Hashem. Kelm lived on in my zaide. He lived b’emes. His Torah, avodah, bitachon and middos were all layered with, and guided by truth. When the great baal mussar Rav Leib Chasman was a still bochur in Kelm, the local esrog merchant showed him a magnificent esrog. The next day, the seller tracked him down to tell him that he had found a nicer esrog than the one he showed him the day before. The merchant was shocked when the bochur said that he would buy the one he had seen first. He treasured not only spoken words, but those unspoken as well. My grandfather’s history is unique. There were those who came to America and embodied the glory of what was. Others had never seen the authenticity of the European yeshiva world, but were effective as American rabbonim. Not too many could do both, serving as relics of one world and then managing to become relevant and impactful rabbonim in a new one. That was my zaide. He saw the world he knew b’churbano and then presided over the binyan in a new world. He faced personal tragedy and loss, yet found strength to persevere. He lost so many people, yet found new ones, connecting to all sorts of Jews, influencing those who came from backgrounds so different than his own. The answer can be summed up in a single word. The Alter of Kelm taught his talmidim that for a person to succeed in life without getting hurt, it is necessary to possess the attributes of menuchas hanefesh, a sense of serenity and calm, as well as gevurah, inner strength and fortitude. Rav Levin embodied that lesson. He possessed incredible calm and incredible might. Born in a tiny shtetel named Hanisheeshuk, in Lita, where his father served as rov, as a young boy he left home to learn in yeshiva. He learned for seven years in the Chofetz Chaim’s yeshiva in Radin and for seven years in the yeshiva of Kelm. He received semicha from the heads of the Kelmer Talmud Torah, Rav Doniel Movoshovitz and Rav Gershon Miadnik, as well as from the rov of Kelm, Rav Kalman Beinishevitz. He was a rebbi in the high-school-level yeshiva that Rav Elya Lopian founded in Kelm, and upon the passing of his father-in-law, Rav Avrohom Hoffenberg, he left to assume a rabbinic position as rov of Vashki. Rav Levin very rarely spoke about himself. He would never discuss the “alter heim,” like many other people did. Either it was in keeping with the posuk in Koheles that it is not wise to say that the days that passed were better ones or because remembering the past was simply too painful. I once asked him why he never spoke about Lita. At the time, I thought that perhaps it was too painful to recall all his friends and family members who perished, or that perhaps he found it difficult to think of the life that might have been. He simply explained that he didn’t think it was wise to speak about it, since I would never be able to relate to what he had to say. That was strange. He never put people down. I never heard him speak ill of anyone. I realized that he didn’t mean it as an insult, but a statement. One who exists on a diet of chips and soda cannot appreciate a fine cut of meat, and one who is color-blind won’t be moved by sophisticated art. “You, an American young man,” he was telling me, “can never really understand, so what is the point of speaking?” Speech, to him, was serious. It was a tool used to make an impact, not merely to pass time or get attention. He didn’t see the point. I was referring to Rav Doniel Movoshovitz, his rosh yeshiva while in Kelm. He answered me in six words: “Reb Doniel iz geven ah malach.” He didn’t relate any stories. No tales, no Torahs, no shmuessen. He didn’t look me in the eye as was generally his habit when addressing someone. We were sitting in his study. He looked down at his well-worn desk. I still remember it like today. “Ehr iz geven ah malach,” he repeated. Potent words. Perhaps he wasn’t sure I could handle them. Years later, I understood why he looked down while divulging this, why a look of awe crossed his face. Many years later, I read a story about Rav Doniel and understood what my grandfather meant and why he considered his rebbi a malach. The book, which recounts heroic tales of the Holocaust, described the scene when the Nazis came to Kelm and the Yidden knew their end was near. They were being rounded up and marched out to their certain deaths. Rav Doniel asked for permission to return home one last time to take care of something. Permission was granted. He went home, brushed his teeth, and then returned to the lineup. Calmly and softly, Rav Doniel explained that the community was now going to be offered as korbanos tzibbur. A korban tzibbur is described as bearing a rei’ach nicho’ach, a pleasant smell. “I want to be sure that as a korban, I will have that rei’ach nicho’ach, so I went home to brush my teeth,” said Rav Doniel. No tears. No extraneous emotion. Just what was required of him to be the perfect korban tzibbur. Is that man not a malach? Is there a way to explain this to an American twenty-something who never knew real deprivation? How can one even fathom the gevurah and kedushah, the perfect self-control and focus that this act required? That was my grandfather’s rebbi. That was the world in which he lived. He was on a different plane than the rest of us, though he made sure that wasn’t obvious. I asked him what the Chofetz Chaim looked like. I meant to ask if he looked like the famous picture of him or not. Rav Levin didn’t understand what I was asking. Again, he looked down at his desk and said, in Yiddish, that the Chofetz Chaim looked like a poshuter Yid. “If you didn’t know who he was, you thought he was a simple person. Az men hut nit gevust, hut men gornit gezen. If you didn’t know, you didn’t see anything. Uber az men hut gevust, hut men altz gezen. But if you knew who he was, then you saw everything,” my zaide reflected. The sacredness and splendor of perfect pashtus. I never did get the answer to my question about the picture that day, but I got a much clearer appreciation for the Chofetz Chaim and for his talmid, my zaide. Like his rebbi, my zaide never made a big deal out of himself, but when you watched him, you saw that every move, every action and every word was calculated and al pi Shulchan Aruch and the teachings of mussar. He followed the paths paved by his rabbeim, never deviating. He lived a life of Radin and Kelm, without talking about it, without making an issue of it. When you watched him, you got a glimpse of the greatness that was. I never saw him grow angry. I never heard him raise his voice at people who acted improperly or at us children, running around his house and study. He radiated an unnatural tranquility and calm, never flustered, never rushed, always on time, and always in perfect control of himself. It was incredible to observe. How could a person be so in control of himself? How could a person never be nervous, never be angry, never be pressured? Things happen. People upset you. How could one possess such perfection of character? Rav Levin didn’t drive. He depended on people to pick him up and take him to where he had to go. He never knew if people would be on time, and if they were late, he never got fidgety as he waited for them to show up. His patience and calmness were extraordinary. Working seven years on a middah. Imagine how improved our lives would be if we had that type of discipline. 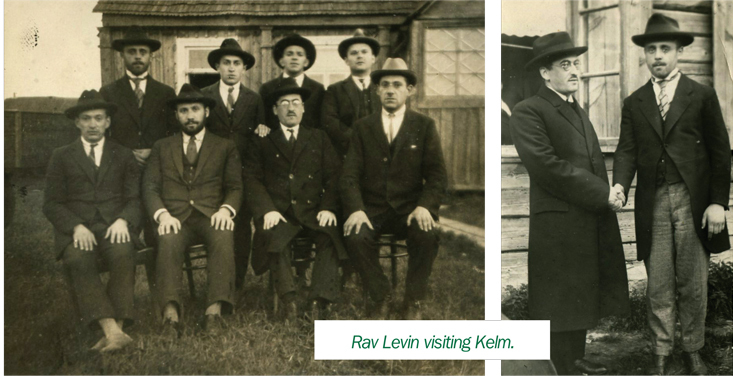 If you looked at Rav Levin, he appeared like a sweet old man who wasn’t in a rush, but if you knew that for seven years in Kelm he worked on the middah of savlonus, then every time you watched him, every time you went somewhere with him, and every time you observed him interact with other people, you saw his greatness, as well as the greatness of Kelm and the middah of savlonus. Breslover chassidus teaches that while the word “savlonus” means patience, Chazal also use that word when referring to gifts, such as when they discuss “sivlonos” given by a chosson to his kallah. A person who is a savlan can accept people, situations and ideas that are different from his own. He thus has the greatest gift of all and can fully enjoy life. Az men hut nit gevust, hut men gornit gezen. Uber az men hut gevust, hut men altz gezen. It was also what saved his life. His history is the greatest testimony to the fact that savlonus, middos and calmness are gifts, the greatest segulah of all. His American relatives literally forced him to leave Lithuania and come to America. He told them that he would come for one year on a trial basis. His kind relatives, who feared for his life and the lives of his family, arranged a rabbinic position for him in Erie, PA. Needless to say, Erie was no match for his hometown of Vashki. Despite the winds of war that were blowing, he let the relatives know that he was going back home. Erie wasn’t for him and he surely wasn’t about to bring his family there and watch them die a spiritual death. Rav Levin allowed a colleague to hold his position in Vashki while he was away so that he could gain experience and have something to show on his résumé that would help him obtain a rabbinic position in a different town. However, when Rav Levin wrote to his friend that he was returning to Vashki and would be reassuming the position, the man was devastated. He said that he would never get another job and pleaded with Rav Levin to let him remain in the position of rov of Vashki. “You are more experienced and better qualified, and you will be able to obtain a position in a different town. I won’t. Please permit me to stay here,” the man wrote. Although it had been his father-in-law’s position and he had occupied it for a number of years, Rav Levin didn’t have the heart to unseat the man from the job. He tried to obtain a position by writing friends and contacts, but as can be imagined, that proved unfruitful. Meanwhile, his American relatives secured for him a rabbinic position in Detroit, which was a definite step up from Erie. With his choices drying up, he moved to Detroit and sent for his family. With their meager possessions and several of Rav Levin’s seforim along with kisvei yad of his father-in-law, the family set sail on one of the last boats leaving Europe before the war broke out. They arrived in the United States just ahead of the destruction of Lithuania. That rov and the entire Jewish population of Vashki were wiped out. No one survived. Hashem yikom domom. It wasn’t easy in Detroit. There were 32 rabbonim in the city at that time and they weren’t happy with Rav Levin. He was what they called “ah greener.” They said, “Vos darf men huben noch a rov? Nisht nor dem, ehr iz a greener, noch tzu der tzu.” They were unwelcoming of the recent immigrant. He lost everything and everyone he held dear in the war. He had three daughters and one son. His pride and joy. Yet, he sent his son away to learn in Cleveland. Can you imagine how much strength that required? A lot more than most people had at that time. Yet, he knew that the only way he could hold on to that son was by sending him away, seeing him just a couple of times a year. Years later, when that one son, my uncle, Rav Avrohom Chaim Levin, was a respected rosh yeshiva, my zaide was vacationing at Camp Agudah Midwest. My uncle was asked to deliver a Daf Yomi shiur to Chicagoans who were vacationing there. Before the shiur, the camp director noticed the elderly rov approaching. “Where is the Daf Yomi shiur to take place?” Rav Leizer asked the director. Assuming that the rov, with his refined nature and noble spirit, felt obligated to attend so as to not embarrass his co-vacationers, the director assured Rav Levin that he should not feel obligated to join and that it was a simple, basic shiur. Rav Levin looked at him. “Do you think I would miss an opportunity to hear my son teach a blatt Gemara?” he asked in surprise. His son was and is a prominent rosh yeshiva, mechaneich and leader, but to Rav Levin there was nothing simple, basic or taken for granted. He would not forgo the simple Jewish joy of a father hearing his son teach a blatt Gemara. He was quiet and determined, and he possessed an iron will and super-human spiritual strength, typical of Litvaks. But he wasn’t the stereotypical Litvak, thought to be cold, unemotional and most comfortable with his own kind. Whenever someone repeats that stereotype to me, I tell them that they didn’t know my zaide. He was warm and tolerant, and he wasn’t a Litvak because he learned in a yeshiva named after a Lithuanian town. He was a real Litvak. He was born there. He was raised there. He went to yeshiva there. He was a rov there. And he embodied the greatness of Lithuanian Jewry. He was full of love for all types of Jews. He was warm and caring. I wear an atorah on my tallis. It was inherited from my grandfather. His second wife was the daughter of a chassidishe rebbe, and when they married, she gave him a tallis with an atorah as a gift. She probably didn’t know that Litvkas don’t wear a silver atorah. So as to not hurt her feelings, for the rest of his life he wore the atorah. Every Shabbos, when I put on my tallis, I am reminded of that lesson. Savlonus not just for ideas and situations, but the hardest type of all: he was able to be sovel other people. He wasn’t negative. He wasn’t cynical. He didn’t ostracize people who had different beliefs than he did. He didn’t look down with disdain upon people who weren’t brought up the way he was. He could sit with simple Jews and talk to them and make them feel that he had all the time in the world and the only thing he wanted to do was sit and farbreng with them. He could maintain friendly relations with people who had entirely different theologies than he did. He treated everyone with respect. A local kosher butcher was found to be engaging in actions that required the Vaad Harabbonim to remove their hechsher from his establishment. The butcher was summoned to a meeting of the rabbonim. While there, he began to scream at the rabbis, cursing and threatening them. The rabbis looked to the yoshev rosh, Rav Levin, waiting for him to respond. Yet, he just sat there, quietly absorbing the man’s abuse. Der vultur iz gevorin zat. The vulture was finally satiated and ended his tirade. The Vaad Harabbonim removed their hechsher. A few weeks later, the store closed down. Der shepsel hut gelebt. It’s not that he didn’t know how to be tough when necessary. It was that his eyes always remained focused on the goal, without the involvement of personal ego and other considerations. A different time, a butcher was caught lying to his mashgiach and Rav Levin felt that this was egregious enough for the rabbinic group to remove their hechsher from his shop. A meeting was called at the Vaad Harabbonim of Detroit to discuss the misbehavior. Some of the attendees expressed pity for the butcher and wondered how he would support his family if the hechsher were removed. That same strength of purpose found him facing a gun one day. While administering a get, the husband jumped up and pulled out a gun, aiming to shoot his wife. Everyone froze, except for Rav Levin, who stood up and got between husband and wife. “The bullet will have to go through me,” he said to the husband. Calmly, he talked the man out of it and took the gun and buried it in his backyard. The poetry! A Litvishe Yid welcoming Shabbos, bringing all of creation along with him to face the great day. And Yom Tov was even more special. He would love to decorate the sukkah. He would pick out the decorations to hang. As he handed them to the grandchild who was there that year, he would say, “Lesheim mitzvas sukkah.” And when Sukkos arrived, there was nothing that could stop him from running into the sukkah to make Kiddush and eat the meal lekavod Yom Tov. After the meal, he would sing songs about the Ushpizin and dance. There was so much kedushah in his little blue and gold canvas sukkah. In fact, one of the grandchildren who spent Sukkos with him one year told me that he thought he sensed the Ushpizin in the sukkah. The ainikel said that there was so much kedushah, he couldn’t handle it and he ran out of the sukkah. As much as he loved being in his sukkah, the next morning, after davening, at a Kiddush in the shul sukkah, he would sit and talk with the Yiddelach who didn’t have their own sukkah. He lingered with them to try to give them a geshmak in the mitzvah, so that they could be mekayeim mitzvas sukkah. The Chofetz Chaim gave my grandfather a four-word mandate: gei redd mit Yidden. Go speak to Jews. It was a mission statement that would encompass his avodah, using his learning, warmth and aristocratic personality to influence, uplift and inspire others. I don’t remember what prompted him to repeat the story, but one evening, Rabbi Shea Fishman and I sat in his Detroit kitchen and he shared the Chofetz Chaim’s directive to him: “Gei redd mit Yidden.” It was the first time I’d ever heard it. It was clearly something that he’d kept private. The moment he shared it, Rabbi Fishman and I looked at each other and said, “It was worth coming to Detroit just to hear that.” Rabbi Fishman repeated the story in one of his speeches at a Torah Umesorah convention. The story was written up and it became a classic. It so defined Rav Levin and his mission in life. The Torah tells us that Yisro took his daughter, Moshe Rabbeinu’s wife Tziporah, and their two children, Gershom and Eliezer, and left Midyan for Mitzrayim. Why does the Torah repeat the reasons that they were given their names? When the Torah tells us of their birth, it relates to us why Moshe gave them those names. What is the significance of repeating that now? Perhaps we can answer as follows. We are all familiar with the Medrash in Parshas Emor (32:5) that states that one of the reasons the Jews were redeemed from Mitzrayim is because “lo shinu es shemom.” One of the primary merits in which the Jews were redeemed from Mitzrayim was the fact that they didn’t change their names. The idea that not changing their names was such a meritorious practice that it merited their redemption bears explanation. My understanding is that a person’s name hints to their abilities and shlichus in this world. When the Medrash teaches that the Jews in Mitzrayim didn’t change their names, it means that they didn’t betray their shlichus and missions. They could have said that being enslaved in a foreign land precluded them from being expected to realize their potential. They could have blamed their situation for failing to accomplish much. We are so different, we don’t speak the language, we stand out, and we are mocked and vilified by many. Who can expect anything from us? Thus, the Medrash teaches that they kept to their missions and did what was expected of them despite the many challenges they had to overcome. When the Torah states that Yisro and Tziporah were going from Midyan to Mitzrayim, it relates that Moshe Rabbeinu’s sons were also not negligent in their shlichus. Although they were brought up in Midyan, without the presence of their father, they remained loyal to the missions he charged them with when he named them. There the Torah repeats not only their names, but also the reasoning for those names. Hashem helped him and saved him from the sword that devastated everyone and everything he had known. And although he arrived in a strange country with a different language and different customs, he stayed the same “Eliezer” in Hanisheeshuk, in Radin, in Kelm, in Vashki and in Detroit until his last day on this earth. Imagine if we lived like that. Imagine if we had the strength and belief to live that way. We would be so much happier and calmer. That is the life of a Kelmer, of a baal mussar, of a ben Torah. We learn Torah. We devote our lives to Torah. We have to work to see that it makes a stronger impression on us. Rav Yecheskel Levenstein would say that the Alter of Kelm was very critical of people who were stubborn and he would seek to cause talmidim who possessed that attribute to leave the yeshiva, even if they excelled in learning. He would say that in order for a person to be helped and guided to achieve greatness, he must be able to accept what others tell him. Let us seek to be accepting and acquire the ability to learn from other people so that we may grow and excel, in Torah, in mentchlichkeit and in all that we do. My uncle, Rabbi Berel Wein, often reflects on the fact that when my grandfather, his father-in-law, was niftar, along with the hespeidim in yeshivos and shuls, there was an obituary in the Detroit Free Press. There, they mourned the leading light of the rabbinate. Somehow, this product of Kelm and Radin had come to an inhospitable climate, unwanted by local rabbonim, and emerged as their leader. Because he listened to his rebbi and spent his life speaking to Yidden. Talking to Yidden requires you to be someone they want to hear from. It means that you have to live in a way that reflects your message. It means loving Yidden. It means taking the time to know the language of each heart. It was the wisest advice of all and my zaide fulfilled it until his last day. I miss him.